I've noticed some strangeness during real-time and progressive renders on particle image sequences. All components are included in the zip file. I'm emitting a sequence of 22 numbered (0 to 21) and colour coded images. The opacities and sizes are shown varying throughout the lifetime of the particle. Both attributes are correct for a screen or final render. Rendering real-time on-screen shows proper size variation but random(?) opacities. Progressive renders show the correct size and opacity but each image is used sequentially for the entire lifetime. The final issue happens while doing progressive renders of the emitter. 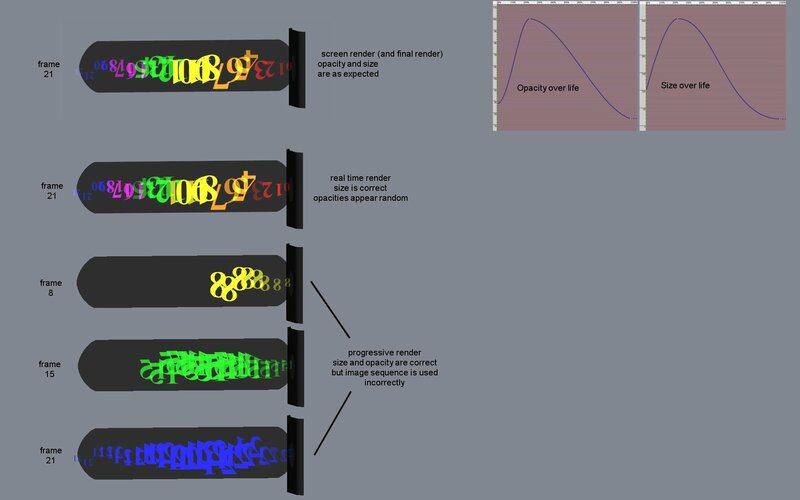 With the action at frame 1, start a progressive render around the emitter; you'll see image 1. You can successfully prog. render for each higher frame. Now start counting down each frame, upon reaching frame 0, A:M crashes on my machine. I presume that is v19 you are using? I've given your PRJ a test in v19b and get your results. I seem to recall real time render has limitations in dealing with complex transparency but i don't know if that applies here. You have the problem well documented. I say go ahead and submit this as a bug report to AMReports.